^ Max Mangold (ed.) (编). Duden-Aussprachewörterbuch (Duden Pronunciation Dictionary) 7th. Mannheim: Bibliographisches Institut GmbH. 2005. ISBN 978-3-411-04066-7 （德语）. ^ Eva-Maria Krech et al. (ed.) (编). Deutsches Aussprachewörterbuch (German Pronunciation Dictionary) 1st. Berlin: Walter de Gruyter GmbH & Co. KG. 2010. ISBN 978-3-11-018203-3 （德语）. ^ see inscription of the engraving depicted in the "1666–1676" section. ^ Baird, Forrest E.; Walter Kaufmann. From Plato to Derrida. Upper Saddle River, New Jersey: Pearson Prentice Hall. 2008. ISBN 978-0-13-158591-1. ^ Antognazza, Maria Rossa: Leibniz. An Intellectual Biography. New York: Cambridge University Press 2009. ISBN 978-0-521-80619-0. page 545. ^ HIRANO, Hideaki. 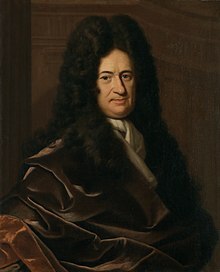 Leibniz's Cultural Pluralism And Natural Law. [10 March 2010]. （原始内容存档于2009年5月22日） （英语）. ^ Mandelbrot (1977), 419. Quoted in Hirano (1997).